The not-so-secret-sewing that I was doing last week is finished now, and has resulted in a Field Study Feather Bed Quilt for Annie to display on her Village Haberdashery stand at the Knitting and Stitching Show next month. 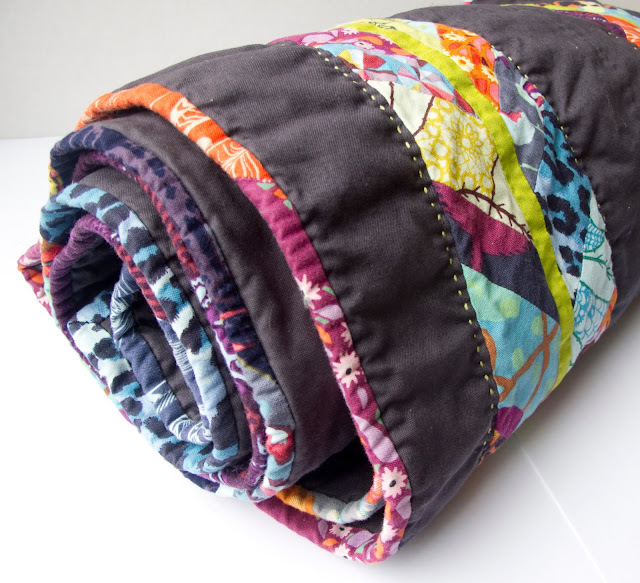 I learned several things from making this quilt. First, bias edges need a LOT of pinning (to be fair, I already knew this but was feeling lazy). Secondly, even large-scale prints can look amazing when cut up into teeny bits. And thirdly, dark grey is a total pain in the arse to photograph. On that note, here are some pretty awful photos of an actually-lovely-in-real-life quilt. 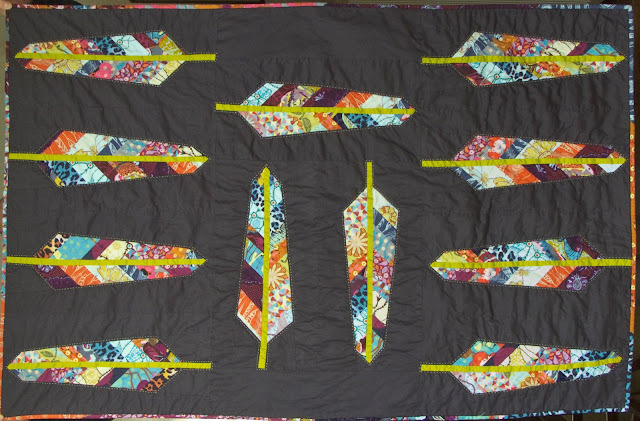 I was a bit stumped on how to quilt this baby, and after consultation with the husband (who is actually surprisingly helpful in these circumstances) decided to outline each feather in a nice bright green. The binding is extremely scrappy, made with the left over strips from piecing the feathers. I’m not normally a huge fan of scrappy bindings but I think it works well here. Do pop along and see it in real life (and maybe pick up a leeetle something), on stand J22 at Alexandra Palace, from 10 – 14 October. Linking up with the Handmade Parade, at There and Back.